NASA and its partner agencies should retire the International Space Station and focus on getting astronauts to Mars instead, Apollo 11 moonwalker Buzz Aldrin said. If NASA and its partner agencies are serious about putting boots on Mars in the near future, they should pull the plug on the International Space Station (ISS) at the earliest opportunity, Buzz Aldrin said. "We must retire the ISS as soon as possible," the former Apollo 11 moonwalker said Tuesday (May 9) during a presentation at the 2017 Humans to Mars conference in Washington, D.C. "We simply cannot afford $3.5 billion a year of that cost." Bigelow Aerospace, Axiom Space or other companies should build and operate LEO space stations that are independent of the ISS, he added. Ideally, the first of these commercial outposts would share key orbital parameters with the station that China plans to have up and running by the early 2020s, to encourage cooperation with the Chinese, Aldrin said. Establishing private outposts in LEO is just the first step in Aldrin's plan for Mars colonization, which depends heavily on "cyclers" — spacecraft that move continuously between two cosmic destinations, efficiently delivering people and cargo back and forth. "The foundation of human transportation is the cycler," the 87-year-old former astronaut said. "Very rugged, so it'll last 30 years or so; no external moving parts." Step two involves the international spaceflight community coming together to build cyclers that ply cislunar space, taking people on trips to the moon and back. Such spacecraft, and the activities they enable, would allow the construction of a crewed lunar base, where humanity could learn and test the techniques required for Mars colonization, such as how to manufacture propellant from local resources, Aldrin said. Then would come Earth-Mars cyclers, which Aldrin described as "an evolutionary development" of the prior cyclers. Aldrin foresees these various cycler iterations enabling a crewed mission to a near-Earth asteroid by 2020 and a Venus flyby by 2024. If all goes well, the first future Mars settlers could launch in the early 2030s, he said. And they will be settlers, not just visitors, if Aldrin's vision comes to pass. 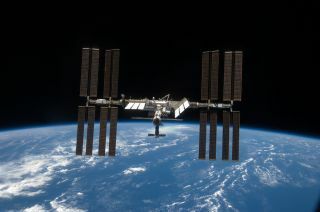 The ISS is currently funded through 2024, and officials of NASA, the Russian federal space agency and other partners have floated the possibility of extending the $100 billion outpost's life through 2028. NASA officials have repeatedly said that the ISS is a key part of the agency's "Journey to Mars" vision, which aims to get astronauts to the vicinity of the Red Planet sometime in the 2030s.